Two weeks ago Mt. Kelud, a volcano roughly five hours away from my home in Yogyakarta erupted spewing ash hundreds of miles. 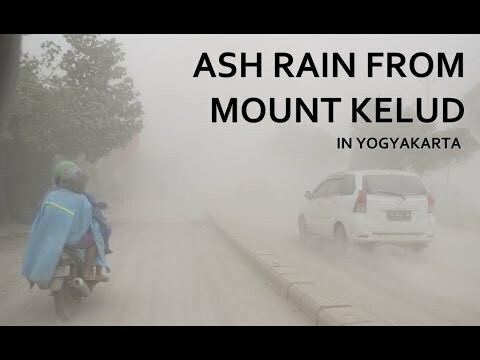 Wind carried the ash all the way to Yogyajakarta where it shut down roads due to visibility issues and laid down a layer 4 centimeters thick. At the time I was in Bali with my family celebrating my quarter-century birthday. Friends still in the city said my lungs would thank me. The eruption shut down multiple airports across the island of Java and left me stranded in Bali alone while my family flew to Kalimantan, another island, to see orangutans. There are worse places in the world to be stranded for a few days I suppose. By the time I returned five days later the ash hadn’t dissipated. The city looked and felt different. The streets felt like a set from an abandoned set from a wild west movie. Sandy-colored ash swam across the ground like puddles deciding where to settle down. A gust of wind brought up wisps of chalky grit that dried out your eyes and skin. Everyone wore masks and sunglasses, but no matter how much protection you wore you couldn’t escape the ash covering your clothes, and inadvertently getting into your mouth. Most people stayed inside, contributing to the gold town ghost town eeriness. I’ve heard it will take around three months to clean the city. Kelud was the second volcano to erupt on my island since I moved here. The other was closer. Two months ago there were massive floods in Jakarta, which shut down the city. An earthquake hit one month ago that shook the ground so violently I thought I needed to lie down because I was having vertigo. Today, it rained harder than I’ve ever seen rain. It felt like all the rainclouds in the world were having a meeting over my house and arguing about who could unload the greatest volume of water the fastest. I went and found my counterpart and his wife to ask if everything was ok. It was raining so hard I thought something might be wrong. They laughed at me. It’s not uncommon for me to be laughed at here for being foolish or unknowingly committing faux pas, but this one struck me. These things are so common to them that my concern was comical. I live in a disaster prone area. We have just about every type of natural disaster here from volcanoes and earthquakes and landslides, to floods and tsunamis. Occasionally there is a loss of life, and there is usually significant damage and disruption. Is it safe to live here? Absolutely. This influences Indonesian culture. It forces people to be less materialistic. At any point your stuff can be swept away or damaged or unrecognizably dirtied. People are much better about dealing with death here. It reminds me a bit of the mild culture shock I experienced in Israel when seeing all of the coffee shops and restaurants filled with people at 2am on a Tuesday night. I remember asking a friend and former IDF soldier if those people had jobs and how they could afford to dine out all the time. He responded that they go to war about every six years and it’s likely they’re all in the reserve services and will be called upon to fight. It’s not worth it to them to save their money or to care so much about a job. In the United States we are both fortunate and shackled by our ability to plan so far into the future. It is seen as one of the ultimate virtues to lay out a plan and see it through successfully. In the United States the perception is the only thing that can hold you back from fulfilling those arrangements is yourself. Volcanoes, tsunamis or wars that affect the average individual, don’t regularly derail our plans. The ability to plan so far into our future can cause us to spend more time there than here. Volcanoes reminded me to be here. ← Family Visit To Indonesia! So true!!! Been mulling over this and trying to explain this concept since we got back.